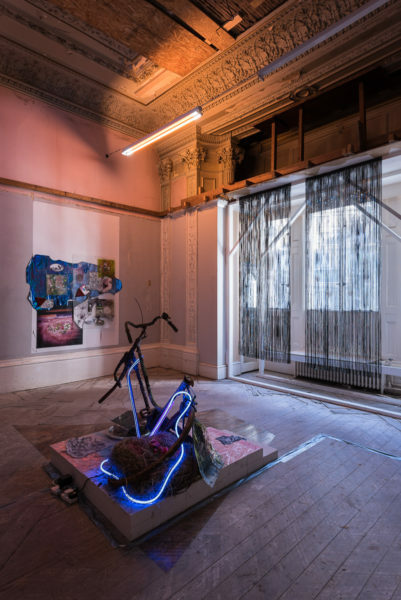 I would like to recommend a show in an unusual location; an abandoned 19th century mansion-turned-hotel that features elements of English Baroque, French Mannerism and Art Deco. The Averard Hotel is just off Lancaster Gate and will soon be converted into a series of apartments. 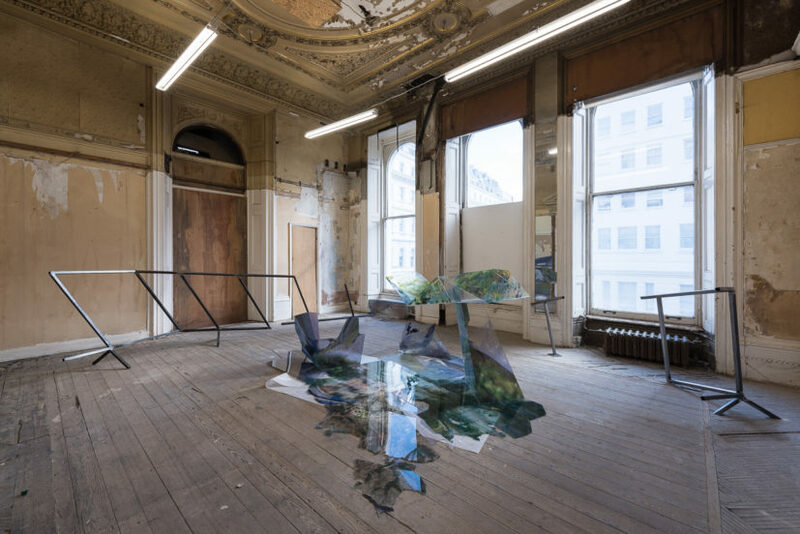 In a state of dereliction, it has been transformed into a setting where visitors can navigate through its rooms to discover a space scattered with videos, paintings and sculptures. 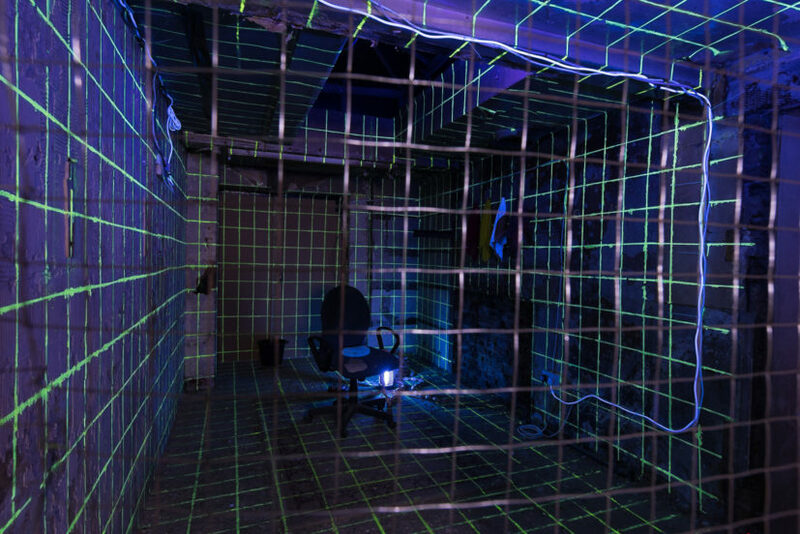 This exhibition by Slate Projects – Alex Meurice’s itinerant London-based project space – has involved Matt Mottahedan. Don’t expect a conventional white cube space, or a traditional picture hanging, the artworks will be your guide through a trail across the two floors of the building. As you pass from room to room you may question if some are indeed artworks or part of the building’s deteriorating fabric. This ambiguity is at the core of the exhibition concept. 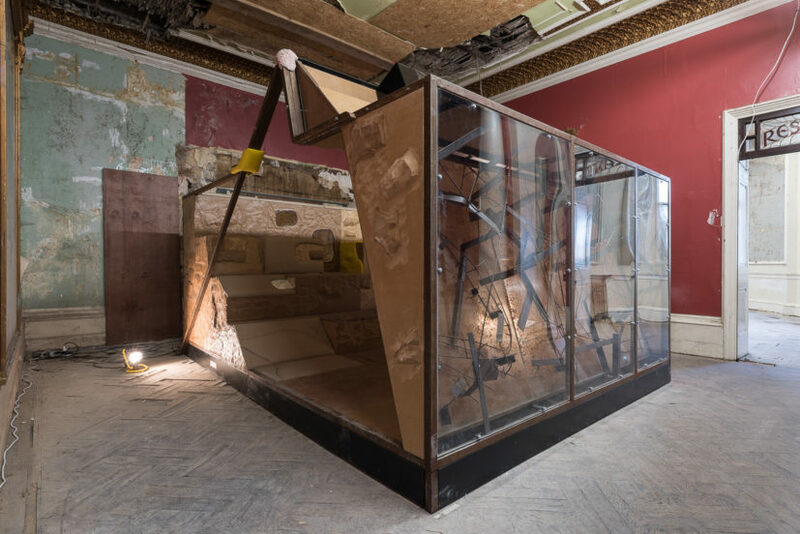 The National or the Skip is a title inspired by something Francis Bacon once said to David Sylvester: “if my paintings didn’t belong in the National Gallery, they were destined for the skip.” Visitors to the Averard Hotel might ask whether the same stark contrast between the famed and forgotten is relevant to the artists exhibited, working as they do across a wide range of different practices. From established artists like Richard Woods (b.1966) or Nathaniel Mellors (b. 1974), winner of the Contemporary Art Society’s Annual Award in 2015, right through to relative newcomers, the artists in this show are never forced into awkward dialogue with one another. Instead there is a strong sense that each has invested in an engagement with the decay that surrounds them. On the ground floor, French-Algerian Neïl Beloufa (b. 1985) presents one of his first videos, originally exhibited at the Venice Biennale in 2013, within an immersive viewing space. 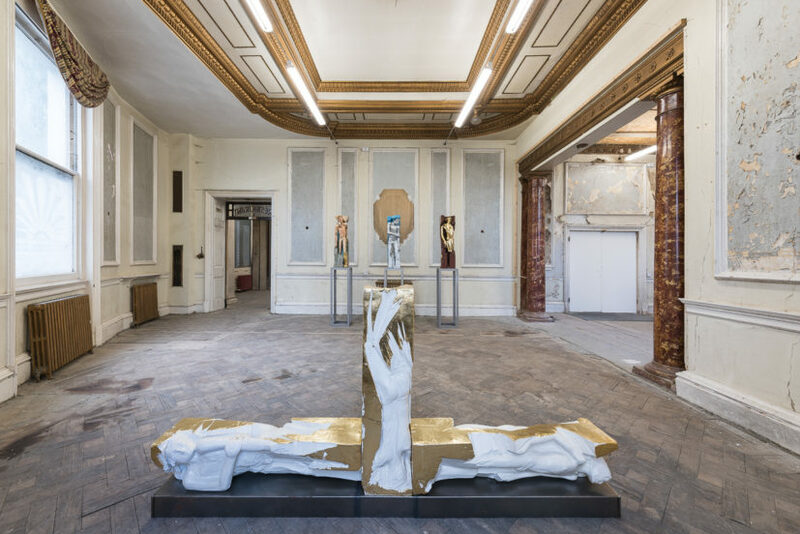 Following this in a larger reception room are sculptures by Los Angeles-based Matthew Monahan (b.1972), works that recall medieval figures and demand careful obserservation. 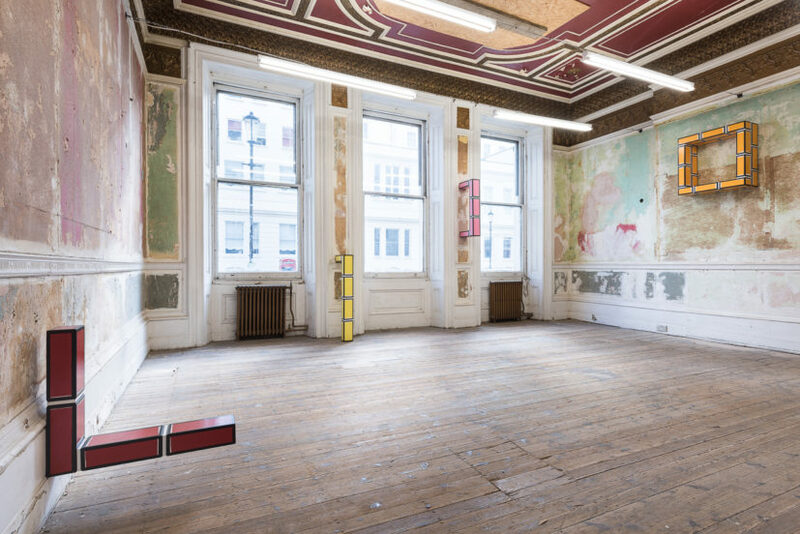 On one of the walls in this room is a mirror painting by Christopher Page (b.1984), an exquiste work that seems to have been left over from the original hotel, suggesting both an intimate and redundant relationship to its surrondings. Indeed, some artists have used the hotel to stress the ambiguity of the location as an idea: Iranian Mamli Shafahi (b. 1982) chose to construct a dark dungeon, a perfect setting for his new installation, while Pietro Roccasalva’s (b. 1970) small marble plaque is cleverly set within a stripped wall, adding a visual layering which suggests an archeological ruin that has survived the destruction of the building it inhabits. Similarly, the bricks of Richard Woods (b. 1966) are architectural interventions that the artist placed himself along the walls, merging constructive elements into the construction itself. By taking the large stairway up to the first floor, you might wonder what other surprising juxtapositions can be found in the exhibition. 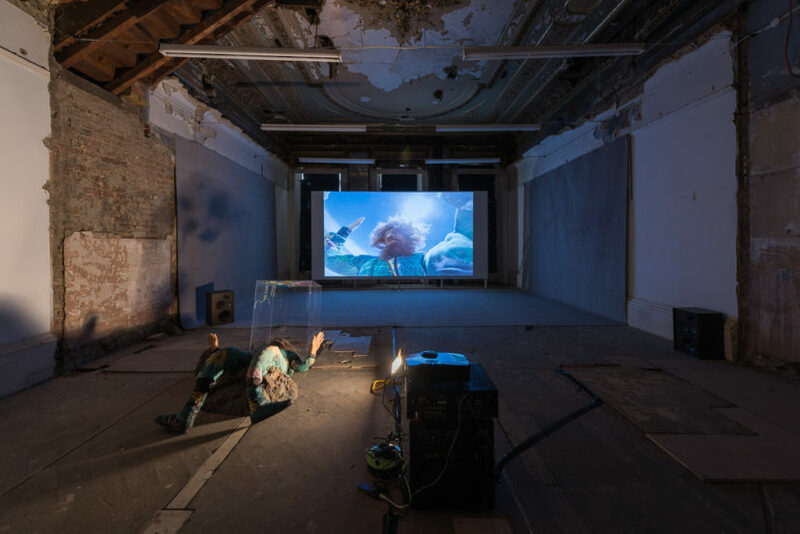 Indeed, the encounter between Nathaniel Mellors’ video with Naïmé Perrette’s (b. 1989) collaged images, sandwiched between plexiglass, certainly builds on the atmosphere of curiosity and exploration that this show has. Do take some time to enter these last rooms. 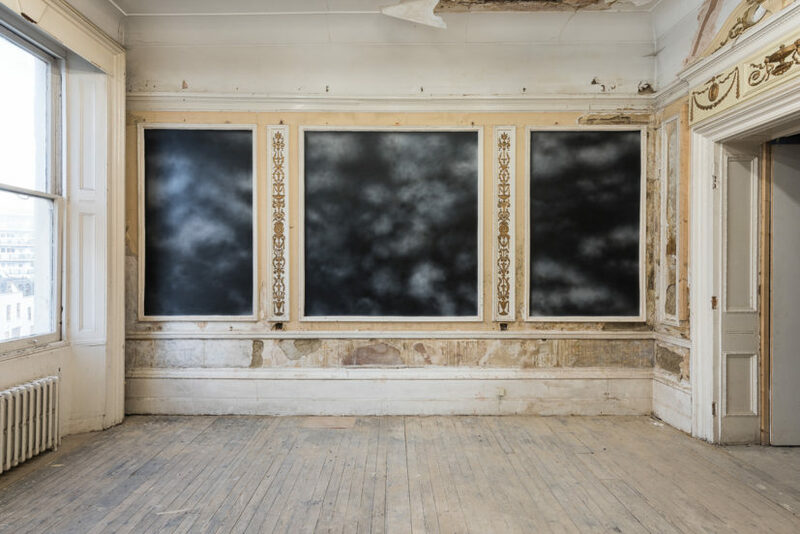 Three large frescoed walls by painter Christopher Page, Mist (2016), create the impression of foggy night skies. Lucio Dalla once said that “when you are with me the room has no walls and becomes a sky”, a sentiment Page has transposed upon a wall. Checking into the Averard Hotel is to encounter a remarkable number of different atmospheres. This exhibition is runs only for a few weeks, until the 23 October, so I hope you have a chance to enjoy it.